Spike Chunsoft is breaking out the big guns when it comes to visual novels with this one. Say hello to the only VN rated a perfect 40 by Famitsu. Spike Chunsoft is a name that I’m sure many of us have heard. Whether it’s from Danganronpa, Zero Escape, or the Mystery Dungeon series we, as gamers, know the name Spike Chunsoft. However, we also know of these titles thanks to different publishers. Be it NIS America, Aksys Games, or Nintendo we associate Spike Chunsoft games with other companies. This leads to an interesting predicament. How does Spike Chunsoft differentiate itself from these companies? While Idea Factory International used the Neptunia series when in the same situation, Spike Chunsoft didn’t have an unlocalized Danganronpa or Mystery Dungeon game to fall back on. So instead, they decided to bring their crown jewel over from Japan. A game that not only scored a 40/40 from Famitsu but was also one of the only visual novels to do so. I’m talking about 428: Shibuya Scramble. In terms of visual novel design? Absolutely! You don’t get a 40 out of Famitsu by random chance. 428: Shibuya Scramble was originally released for the Nintendo Wii as 428: Fuusasareta Shibuya de or 428: Blockaded in Shibuya. Since the original release, the game has been ported to the PlayStation Portable and PlayStation 3. Now though, Spike Chunsoft is bringing the game to both the PlayStation 4 and Steam in September of this year. Like I mentioned, during its initial release the game was critically praised. But why? How could a visual novel be good enough to score a perfect 40 in Famitsu of all places? Well, let’s delve into the premise to begin explaining why. The premise behind 428: Shibuya Scramble sounds pretty normal at first. A woman by the name of Maria Osawa is kidnapped. The kidnappers demand a ransom and Maria’s sister, Hitomi, cooperates with the police in order to deliver the ransom. The exchange is to take place outside the famous Hachiko statue by Shibuya Station. With the police in place and watching Hitomi things seem to be going according to plan. But if you’ve played Danganronpa or Zero Escape, you know Spike Chunsoft doesn’t do simple. 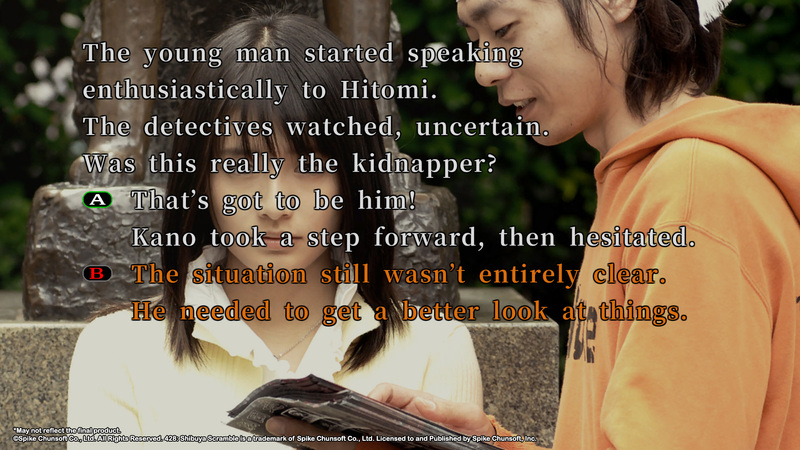 The exchange occurs, but the kidnappers tell Hitomi to find a blue van before yet another person shows up and attempts to murder her. As things begin to escalate out of control, the government tries to lockdown Shibuya. Why? Well, that will be a mystery our protagonists will have to solve. And yes, I did say protagonists. 428: Shibuya Scramble is unique in that it has five main characters. Achi Edo, a former street-gang leader; Shinya Kanou, a detective who is part of the ransom exchange; Kenji Osawa, Maria’s father and a virus researcher; Minoru Minorikawa, a freelance journalist; and Tama, a woman who is working part-time as a costumed giant cat mascot. These five characters will not only cross each other’s paths, but their decisions will greatly affect each other’s stories. The character select screen. Note that this portion of the game takes place between 11 AM and 12 PM. 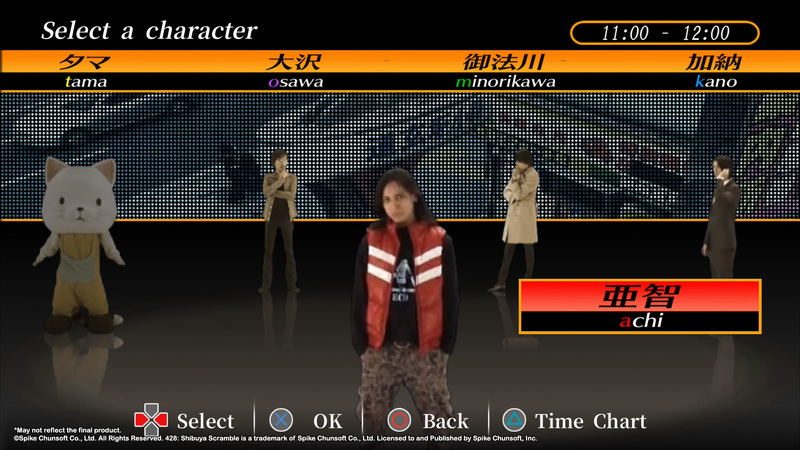 You see, another interesting feature of 428: Shibuya Scramble is that each character’s actions will open or close certain paths to the others. The flow of gameplay works something like this. The game takes place on April 28th between 10 AM and 8 PM, with the game progressing in 1-hour blocks. Your goal is to get each protagonist to the end of the hour. Once that’s done the next hour will open up. However, along the way, you’ll be given various choices. These choices can range from deciding to intercept someone who you think maybe the kidnapper, to giving directions to a couple of guys who turn out to be yakuza members. 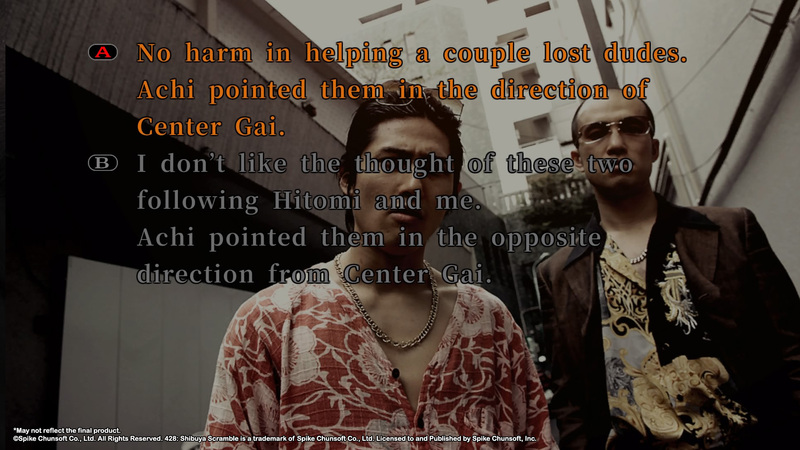 If you pick the wrong choice, such as giving those yakuza members directions, you may block off another character’s path. Thus making their section impossible to complete until you go back and change that decision. This ends up giving 428: Shibuya Scramble up to 85 different endings. And getting to the end is going to require you to do some thinking. Thankfully, the game does have some assistance in the form of tooltips. Decisions like these can have consequences, not just the current character’s route, but in the others as well. The tooltips in 428: Shibuya Scramble work just like the ones you find in many other text-heavy games like Super Robot Wars or Hakuoki. Important terms will be highlighted and by pressing a button you’ll be able to select those highlighted bits. Doing so will give you additional information. This is especially useful for those of us who don’t live in Japan and may not know the significance of the Hachiko statue. However, this is where I have my only issue with the Anime Expo demo. This text was too light. Since the base text is white, you’d expect the developers to utilize a much darker color for the tooltip text. Which they do use to highlighted tips you’ve already read. However, before the tip is read, it’s a much lighter blue. In fact, I had trouble sometimes seeing what was a tooltip and what was text. This led me to start hitting the tooltip button every time I advanced the dialogue just to be sure. Hopefully, this is something that the developers can easily adjust before the game launches in a few months or via an update later on. That said, what’s my conclusion when it comes to this title? While the white lettering works really well for regular text, imagine any one word being a very light blue. As you can imagine, it blends into the white of the text, especially on certain backgrounds. 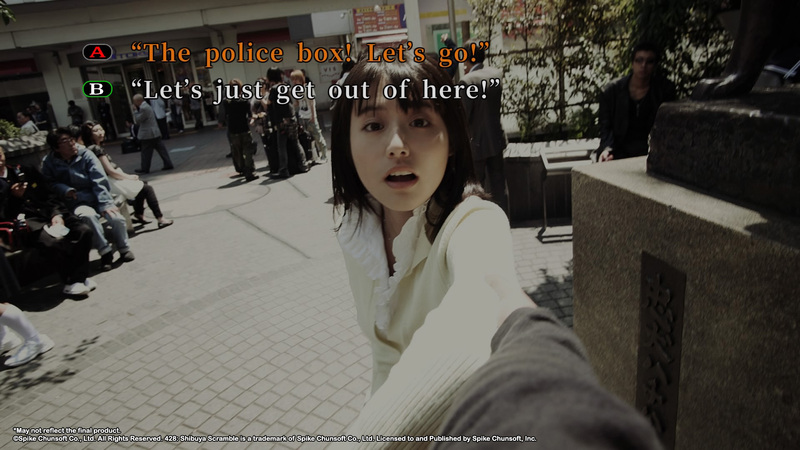 428: Shibuya Scramble is the game I think Spike Chunsoft needs right now. A high-quality visual novel is a great way to showcase what this company is capable of. Yes, Spike Chunsoft is localizing STEINS;GATE ELITE. However, that’s a 5pb title. This is Spike Chunsoft’s own creation and I think it’ll go a long way to showing this company can stand on its own much like IFI did five years ago. 428: Shibuya Scramble is coming to the PlayStation 4 and Steam on September 4. 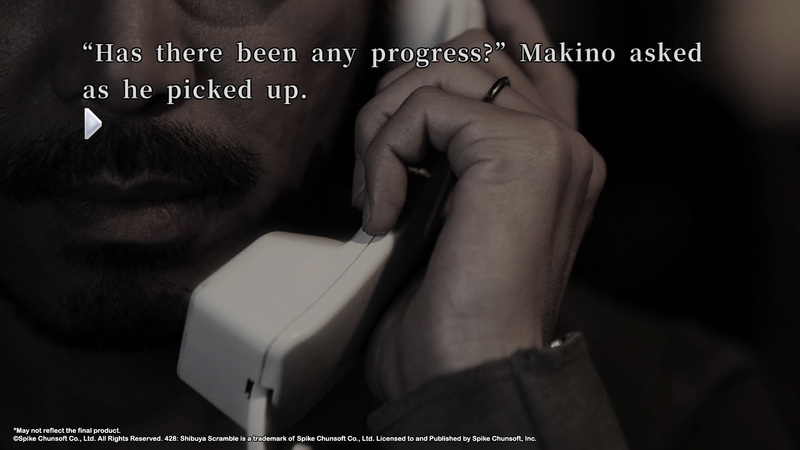 Also, take a look at our impressions piece from GDC and our interview with David Kracker, the localization director of 428: Shibuya Scramble.